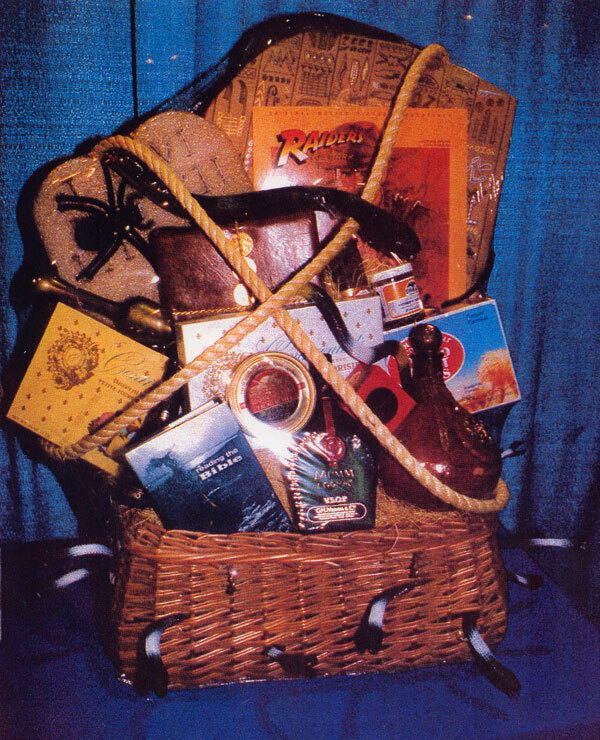 In 1982 I presented my 19th Gift Basket Design, Sales, Marketing and Packaging Seminar in San Francisco at Moscone Hall at the Int. Fancy Food Show! One of the couples in the audience came up to the stage after the Seminar and invited myself and my wife to Dinner! They told me that they had just purchased a Wine and Fancy Food Store in the L.A area! He said that the Seminar was very exciting and that He and his wife were going to really do great things with the ideas and the concepts that I presented them with! 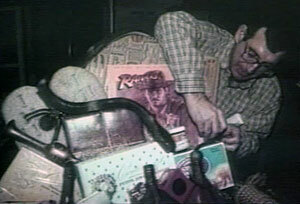 His name was Tom Bwarie, and the store was Bwarie’s Wine and Fancy Foods in Sherman Oaks! As it turned out he did just that and his Store became the Store of choice for Great Looking Theme Gifts for all the major Hollywood Studios! He had picked up Paramount, Columbia, 20th Century Fox, Universal Metro-Golden Mayer as clients! 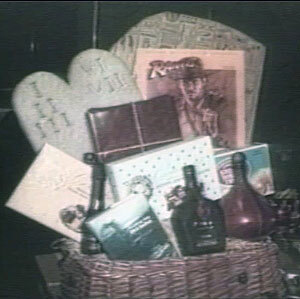 When Stephen Spielberg finished his movie which was called Raiders of the Lost Arc the cast wanted to give Stephen a Gift Basket about the Movie! His secretary calls Tom’s store and told him that they wanted to spend $3500.00 for a Special Theme Gift for Stephen but it had to be something different than just a ordinary Gift Basket filled with Fancy Foods and Wine! He told them that he could do it but he needed more theme concepts about the movie! When he heard that it was about an America Archeologist into leather and whips in Egypt searching for the 10 Commandments with lots of snake, sand, blood, guts and the Nazis he was puzzled! He said to himself, how am I going to come up with a Theme Basket for this Concept! Then he said a LIGHT WENT ON OVER HIS HEAD! He said I know what I have to do! I will call Tom Catanese, he will know what to do! So the next day I get a call from Tom Bwarie! Tom called me and told me about the problem! I said let me think about what I can come up with! He said that he needed to deliver the Gift in three weeks! I wrote all the words and all the things that he told me about on my think page! After two days I called him back and told him what I wanted him to do! I said, go and buy 15 12” plastic snakes! Then go to a craft store and buy a large piece of Styrofoam and cut it out much like the tablets of the 10 Commandments, then spray it gold and then distress it and make it old looking! Then make a Styrofoam shaped Rosetta stone wrap it in brown paper and using a gold pen make Egyptian numbers and letters! Then go to a fabric store and buy leather, canvas and burlap fabrics and cover the Fancy Foods and Wine Bottles in these materials! Get some artificial spider web spray! Now you will need a Giant Wicker Hamper! Take the snakes and using a screw driver and pliers spread the weave of the wicker spines open and place the snake’s heads thru but don’t pull them all the way out of the Basket! Now pack the basket with all the products! After you shrink wrap the basket go back to each snake’s head and cut a small hole around the head and then pull the snakes head out about 8” from the basket! In this way when you move the basket all 15 snakes will wiggle their heads! 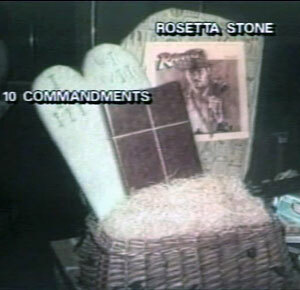 When they were finished with the Gift it weight in a 113 lbs and it took two men to pick it up! When they delivered it to his office as they walked in, he jumped up on his desk and started to dance around!.................................?????????????? Now three weeks have gone by and I have not heard from my friend! He never got back to me and so I call him and ask him what happened? He said, Oh it worked beautifully! I said, send me a photo? Oh No, Tom he said I did not take a photo!!!!!!!!!!!!!! I said it’s a shame you could have reaped tons of PR for your store! That was in late 1984! In early 1985 our International Fancy Food Show was to move to LA for the first time in its History! So I decided to do my own Raiders of the Lost Arc Gift so that I could display it at our Booth in LA. The photo that you see is the Gift that I designed! Only I did a few new things! I added an enlarged photo of Harrison Ford! I placed a tape recorder in the back of the Gift with the theme music in it! The Gift is almost 50’’ tall and cost was $300. This Gift was the reason I designed and create the Rolls Royce Gift in 1986 in New York at the Fancy Food Show at the Javit’s Convention Center! Other Gifts that I have designed include; Theme Gifts for Aaron Spellings 1980’s TV Soaps, Love Boat, Dynasty, Dallas, Falcon Crest, ET, Frank Sinatra, Desperate Housewives! To view the Video of the wrapping of the Rolls Royce go to; www.thomascatanese.com and click on the blinking yellow line! If you are in the Gift Creation and Gift Basket Industries and you are ready for many NEW concepts that will propel your business ahead of your competition then make the investment in your Future! For under $200. I will share with you my 40 years in the Industries that I serve and provide you with all of my short cuts, trade secrets and inside information about how to increase your SALES and PROFITS! My 10 hour Video Home Study Business Course will set you on a Path to success in your home town! To read about all the contents that are in each video go to the home page and click on the Gift Basket Video icon! There you will find the most professional, profitable and most interesting Award winning Videos that will help get you over the Business downturn that we are now experiencing! Act today to help your Business! Copyright © 2008 ThomasCatanese.com; all rights reserved.